The two features have been rumoured for a while now, and this revelation has confirmed it. The new Apple MacBooks are scheduled to launch tomorrow, October 27. Just ahead of its launch, a series of images have been revealed by MacRumors from the source code of macOS Sierra’s 10.12.1 update. The images are purported to be of Apple Pay, confirming the numerous rumours surrounding the customisable OLED touch panel and the inclusion of Touch ID on the new MacBook Pro. The images confirm a design overhaul of the MacBook Pro, giving us more information on the OLED touch bar. The panel replaces the part where the old function keys used to be, and in place of physical keys, will present contextual representation of shortcuts and quick access options based on what is being displayed on the screen. The power button of the MacBook Pro retains a similar position, but becomes nearly invisible, at least from the photos. Not only is the new power button fused almost seamlessly with the touch bar, it also gets Touch ID integration, as the revealed image of Apple Pay clearly shows Touch ID being used for authentication. 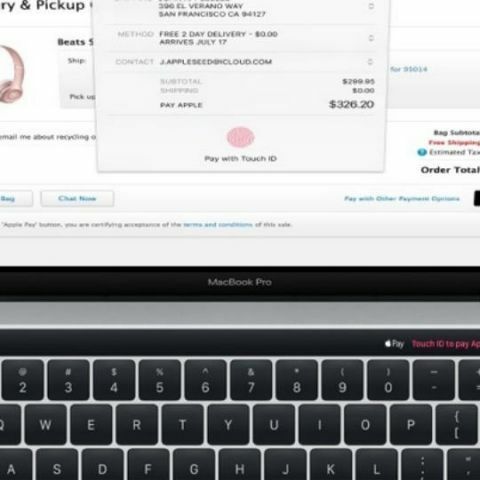 The touch bar will add more flexibility to the MacBook Pro, hopefully enhancing productivity. The images seem to show the 13-inch variant of the MacBook Pro, which also gets speakers on either side of the keyboard. Apple also seems to have worked on a new hinge mechanism, and although we cannot determine anything from the photos, the new MacBook Pro has been said to be thinner and lighter. It also shows thinner screen bezels, making it more compact and light on overall terms. The entire makeover is expected alongside latest generation hardware on the new MacBook Pro. Apple’s MacBook event will take place tomorrow, October 27, at 10:30pm IST. Alongside the now-almost-revealed MacBook Pro, we also expect to see a new MacBook Air, while a new iMac may also be unveiled. This year’s MacBook event is a throwback to the launch of Apple’s first Macintosh back in 1984. Named ‘Hello Again’, Apple is finally expected to bring a much-desired cosmetic and performance upgrade to its coveted line of MacBooks.